We may often see a few strands of hair in the sink after prepping our hairstyle for the day. This can be a disturbing sight for many women and men, especially if it is a frequent occurrence—or if those few strands grow to even bigger clumps. There are several key factors involved when it comes to hair loss, but, fortunately, simple lifestyle changes may help stop thinning hair in its tracks. So, don’t fret and read on. We’re going to share some valuable tips on how to stop hair from falling out. The term hair loss refers to when hair begins to thin out or bald patches appear on the scalp. This occurrence of hair fall does not discriminate as some dermatologists report up to five percent of women under the age of 30 and nearly 60% over 70 are affected. 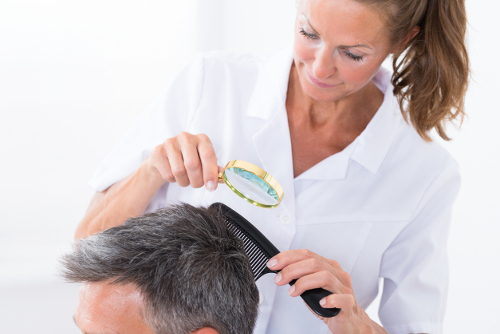 Two-thirds of men under the age of 35 see the signs of hair loss, and that number can rise to 85% by the age of 50. In many cases, this hair loss can be avoided by adopting new hair care regimens or strategies for how to prevent hair fall. So, why does hair fall out? A common cause of hair loss is genetics, but your health, daily diet, environment, and the way you treat your hair overall can help answer this question for you. The following tips serve as lifestyle techniques for how to stop hair from falling out. Your overall health plays a major part in the health of your hair, including its ability to grow. Disorders and diseases affecting your immune system, thyroid, blood circulation, and hormone levels can have a direct impact on the health of your hair follicles. Ensure to monitor your blood sugar levels as well as your iron levels. Part of maintaining good overall health for healthy hair and scalp is consuming foods that can prevent hair loss. Foods with essential fatty acids of omega-3 such as salmon greatly boost cell health. Include natural foods of proteins, folic acid and vitamins B6 and B12 such as fresh vegetables and fruit, lean meats, poultry, and whole-grain and dairy products. Iron plays a major role and can help to reverse hair loss in some cases. We tend to experience stress in varying degrees depending on the situation and our physical and mental health at the time. It is important to avoid stressful situations and deal directly with the issue at hand when it occurs. Telogen effluvium is a stress-triggered medical condition that causes the hair to remain in the resting period of the natural hair growth cycle. The end result may be scattered shedding of the scalp. To help manage stress and release the day’s experiences on the mind and body, participate in a regular exercise routine. This can include simple breathing technique exercises, meditation, yoga, walking, or a gym workout. The beneficial components and properties of many essential oils may boost hair health as well as support the natural hair growth cycle. The use of peppermint, lavender, thyme, rosemary, grapeseed, and jojoba oils has been studied for patients with alopecia areata with positive results. In addition to treating the hair on the inside, taking extra precautions with the physical touch of the strands may help prevent hair fall. Use wide-tooth combs and soft-tipped brushes. Gentle strokes of the hair when styling will avoid damage to both the strand and the follicle. Be sure to not brush wet hair as this is when it is at its weakest. When styling, it is best to avoid towel drying hair with firm shakes, and use the high heat of a hair dryer sparingly. The vast array of hairstyles such as up-dos, braids, and ponytails may be fashionable, but the tugging and taut pulling can damage hair strands. Hair loss can also be prevented by treating dandruff as it happens. When the scalp is constantly being scratched due to itchiness caused by dandruff, hair strands become fragile and easily break. We know the effects of smoking can be detrimental to our health in many ways, and the health of our hair is no exception. The chemicals contained within smoking products can narrow our blood vessels, preventing our hair follicles from receiving adequate supply of blood. For many of us, our hair makes a visible statement about our personality, our outlook on life, and our self-image in general. Hair loss of any nature can be alarming, and, thankfully, most cases can be reversed and even prevented. Our hair strands and follicles depend on good health and tender loving care. There are many opinions on how to care for hair, and as to whether beauty trends harm the strands such as coloring, heating tools, and shampoo build-up. Only you know how your hair reacts to certain products and styles, as every individual will have different results. We hope the above lifestyle changes and tips on how to stop hair from falling out will help you on your journey to fuller, healthier hair. Laino, C., “Expert Q and A: Fighting Hair Loss In Women,” Web MD; http://www.webmd.com/skin-problems-and-treatments/hair-loss/features/fighting-hair-loss-in-women#1, last accessed April 21, 2017. Shatzman, C., “7 Ways to Regrow Thinning Hair, According to Dermatologists,” Health, January 30, 2017; http://www.health.com/beauty/how-to-regrow-hair, last accessed April 21, 2017. “Diet and Healthy Hair,” Web MD; http://www.webmd.com/skin-problems-and-treatments/hair-loss/men-hair-loss-17/eat-right-healthy-hair, last accessed April 21, 2017. Ganwani, P., “10 Tips To Prevent Hair Loss,” The Health Site, March 19, 2015; http://www.thehealthsite.com/beauty/10-tips-to-prevent-hair-loss/, last accessed April 21, 2017.